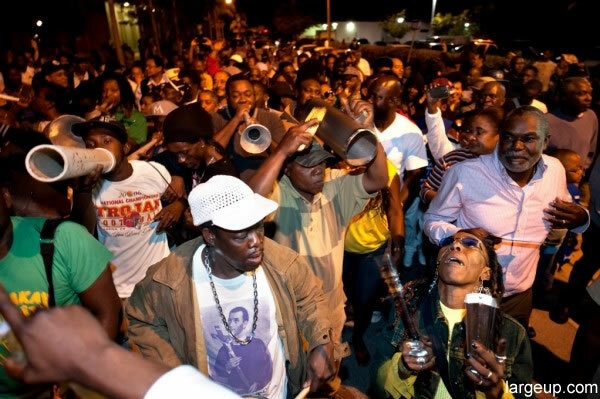 Here is a picture of the famous Haitian musical band Rara Lakay in little Haiti Miami Florida. Big Night in Little Haiti is held every third Friday of each month. November's theme was Haitian Roots, part of an eight-day festival, the 31st Miami Book Fair International, hosted by Miami-Dade College's Center for Writing and Literature. BNLH introduced Lakou Mizik to American audiences. The concert was a pastiche of music styles, influential musicians, and timely social issues, but also traditional music, reinvented for today's audiences. Lakou Mizik has recording spaces in Port-au-Prince and Jacmel. Rara, the latest genre of Haitian music, is an electronic dance music format. It is percussion-based using petwo drum rhythms from Africa. Tin horns and cylindrical bamboo trumpets round out the Rara sound. A popular Rara group called Rara Lakay leads dancers through Little Miami streets during Lent. Other times they hold private events at homes. The lively Rara sound emerged in the aftermath of the 2010 earthquake, symbolic of the resiliency of the Haitian spirit.